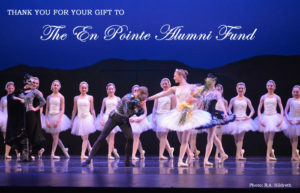 Established in 2015, The En Pointe Alumni Fund is a commitment of alumni to the future of The Rockbridge Ballet. Your tax-deductible donation is exclusively used towards the tuition costs of talented company dancers requiring financial assistance. You are helping young women and men have the opportunity to grow as dancers, develop confidence, and form friendships. You will always be a part of The Rockbridge Ballet family, and your generous donation will leave a legacy for future dancers. Make a secure online donation now by clicking the PayPal button below or send a check to The Rockbridge Ballet, PO Box 150, Lexington, VA 24450, Attention: Alumni Fund.